Preheat oven to 160°C (325°F). Place the banana, brown sugar and 20g of the butter in a medium non-stick frying pan over high heat. Cook for 4–5 minutes or until caramelised. Add the whisky and mix to combine. Place the milk, coconut, vanilla, eggs, flour, caster sugar, banana mixture and remaining butter in a blender and blend until smooth. Pour the mixture into a lightly greased 18cm (1-litre-capacity) pie dish. Place on a large baking tray and cook for 30 minutes or until just set with a slight wobble. Set aside to cool completely. 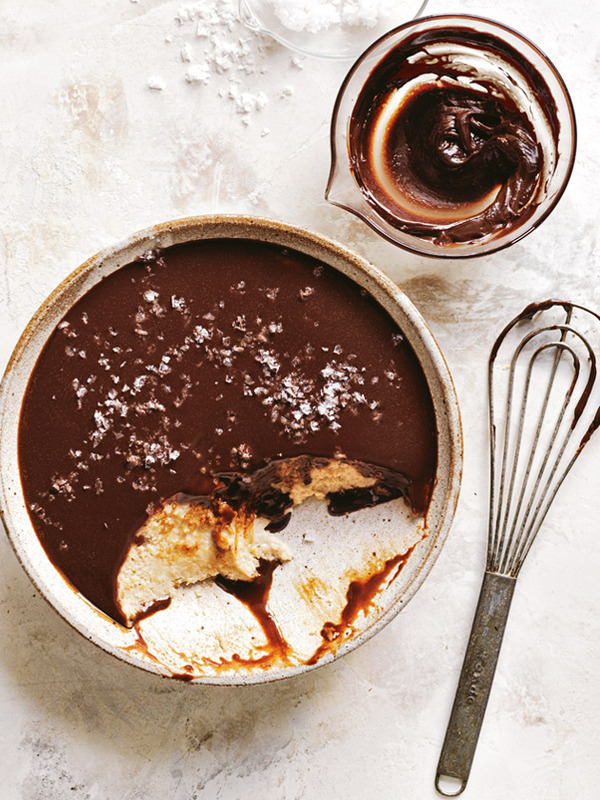 To make the salted chocolate ganache, place the cream and honey in a small saucepan over medium heat and bring just to the boil. Add the chocolate and remove from the heat. Mix until smooth. Place in small bowl and set aside to cool slightly. Pour the ganache over the pie and sprinkle with salt to serve. Serves 8.